Improving their mental capabilities thereby making them think and remember. Intermittent claudication: This refers to unbearable muscular pain occurring especially in the calf muscles due to exercising, walking etc. While this pain goes away after a short period of rest, it is indicative of irregular blood flow to these regions. Ginko Biloba helps people suffering from this ailment to walk for longer period of time without feeling any pain by ensuring that the flow of blood to these regions is properly regulated. Improvement and enhancement of memory: Known as a “brain herb”, Ginko Biloba is a common ingredient of fruit smoothies, nutrition bars, health drinks etc. It helps to give a boost the sense of perception as well as memory power when taken regularly. Glaucoma: This is generally caused due to a damaged optic nerve and can lead to permanent blindness if left untreated. Intake of Ginko Biloba on a routine basis not only helps to delay the onset of blindness but also causes a marked improvement in retinal vision. Macular degeneration: There are a number of other ailments and afflictions which can cause progressive degeneration of the retina leading to blurred vision and even blindness. More often than not it is age related and can be effectively controlled by taking Ginko Biloba regularly. In some cases, the flavonoids present in Ginko Biloba have also been successful in completely reversing and curing macular degeneration. Blood circulation: Ginko Biloba, when taken in the form of tea on a regular basis also helps to stimulate the proper circulation of blood throughout the body. In fact it also helps to inhibit the clotting of blood within the blood vessels as well as minimise the coagulation of blood clogging of the arteries. Mood swings and depression: People taking Ginko Biloba tea also feel an additional energy boost which also helps to cure them of mild depression. It also helps to induce sleep in people suffering from sleep deprivation thereby inducing a feeling of goodness and positivity. Their acting as receptor agonists which help to keep the blood pressure as well as heart rate under control thereby greatly reducing the chances of an onset of a heart attack. 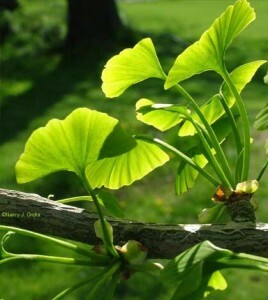 Ginko Biloba is also a very powerful antioxidant and helps to free our body from the harmful effects of free radicals. It also helps in the repair of damaged cells, promotes libido, helps to cure hearing disorders like tinnitus etc. The health benefits of Ginko Biloba are so varied and innumerable that many of them are yet to be discovered. But it goes without saying that a daily dosage of Ginko Biloba definitely works wonders for the human body, mind and soul.